The Culling of the Books has begun again. It’s the process in which old friends and acquaintances (and a few new ones) are (1) put up for sale on eBay, (2) offered to used bookstores, (3) left at the city’s book exchange shed, (4) recycled or (5) even consigned to the trash. It happens as regularly as an atomic clock ticks, but not quite so often. Some will survive the process, only to be assessed at the next CotB. No one will be safe forever! This is why I picked up my 1975 paperback edition of Fields, Factories and Workshops this afternoon. First published in 1898, it’s a classic statement of anarchist principles written by Peter Kropotkin, more formally known as Prince Pyotor Alexeyevich Kropotkin. 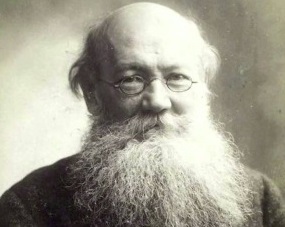 Kropotkin was a Russian aristocrat who favored the overthrow of both capitalism and the state. He envisioned a future in which small communities, linked together by modern technology, would grow much of their own food and do much of their own manufacturing. He championed cooperation over competition and rejected the authoritarian socialism of the Bolsheviks. This is the kind of book I was reading in the 1970’s when I started wondering why our economic system leaves so many people idle when there is so much work to be done. Each nation – her own agriculturist and manufacturer; each individual working in the field and in some industrial art; each individual combining scientific knowledge with the knowledge of a handicraft – such is, we affirm, the present tendency of civilized nations. Be it handicraft, science or art, the chief aim of the school is not to make a specialist from a beginner, but to teach him the elements of knowledge and the good methods of work, and, above all, to give him that general inspiration that will induce him, later on, to put in whatever he does a sincere longing for truth, to like what is beautiful, both as to form and contents, to feel the necessity of being a useful unit amidst other human units, and thus to feel his heart at unison with the rest of humanity. Fields, Factories and Workshops is one of those great prophetic works of the nineteenth century whose hour is yet to come…His book is really a thesis … on the economic consequences of the humanization of work. This entry was posted in Economics, History, Philosophy, Politics and tagged Anarchism, Capitalism, Peter Kropotkin, Political Philosophy, The Culling of the Books by LWF. Bookmark the permalink.